Yaskov: By the way, we are being photographed. Yaskov: Yours. I recognize the mustache. Miles: Oh, that's Follett. He's an idiot. Probably no film in the camera. 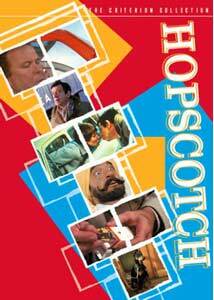 Hopscotch isn't the type of movie Criterion usually releases. It wasn't directed by anyone special (though helmsman Ronald Neame has a fairly respectable body of work under his belt�he was a cameraman on Hitchcock's Blackmail and nominated for an Academy Award® for the screenplay of Great Expectations). It wasn't a remarkably popular, influential, or critically acclaimed release. It does star Walter Matthau, but Criterion has never been about name recognition. It is, nevertheless, a very fine film, a winning comedic thriller with Cold War overtones that feels a little dated today, but remains remarkably entertaining. It's one of the best roles of the latter part of Matthau's career. He plays Miles Kendig, an old-fashioned CIA agent who believes in getting the job done, not in getting people killed. After an operation in Germany, during which he recovered some stolen microfilm but allowed his equal at the KGB, Yaskov (Herbert Lom), to escape (theorizing that the known enemy is better than a new enemy), he is reprimanded by his new boss, hotheaded, foul-mouthed Myerson (a frantic, amusing Ned Beatty). Facing his twilight years stuck behind a desk, Kendig decides to have a little fun. He starts writing a book that will expose all the dirty little secrets he's gathered over his years with the agency�from botched assassination attempts to costly projects that went nowhere�and he's going to mail it out one chapter at a time. Myerson is none to happy about his dealings, and Yaskov wants him silenced before he reveals anything to incriminate the Russians. With the help of his ex-lover Isobel (Glenda Jackson), Kendig will keep a hop, skip, and a jump ahead of his pursuers, including his prot�g�e (Sam Waterston) and a bumbling field agent (Matthau's son David). Hopscotch is a leisurely paced caper, a lighthearted lark sans action set pieces and with no violence to speak of (no one even gets hurt, let alone killed). The Cold War motivations are out of date these days, but they aren't that important to the film anyway. If you wanted to be analytical, you could say there are some metaphorical overtones in the changing of the guard from Kendig's ideals of honor among spies to Myerson's inclination to shoot first and then shoot again to make sure the job is finished. But such concerns are of minor importance to the narrative. The real fun here, though, is watching Kendig outwit his superiors at every turn. The plot is convoluted and contrived, and Kendig is a little too good at predicting what Myerson is going to do next, but the chase is played for laughs, so external logic isn't that big a factor. Better to savor the mature chemistry between Matthau and Jackson (who were a hit together in House Calls) and giggle at Matthau's deadpan performance against Beatty's over-the-top hysterics. Ronald Neame handles the material well, letting the characters breathe without sacrificing the comedic pacing, and he has a good eye for location shooting (the globe-trotting Kendig lands everywhere from Switzerland to the Bahamas). Hopscotch isn't a great movie, and there isn't much heft to the storyline, but it entertains all the way through and provides an excuse to watch Matthau play the game like no one else can. Image Transfer Review: Hopscotch is presented in a beautiful 2.35:1 anamorphic transfer. The color palette is full of rich, saturated tones (it almost looks like Technicolor), and detail is excellent. Blacks are true, shadow delineation is spot on, and the source print shows very few flaws and minimal grain. I noticed no compression artifacts, though there is some aliasing on hard edges and visible dot crawl on complex patterns. Overall, a very nice transfer, and one of the best-looking releases from Criterion (though, to be truthful, most of the films they release are much older, and not from major studios). Audio Transfer Review: Hopscotch was recorded in mono, and the original track has been restored for this release. It's a fine, modern mono mix, with clean, natural dialogue, fine support for the sound effects (which seem to have some directionality even though all sound comes from the center speaker), and a clear recording of the score. There is also a second "edited for TV" audio mix for "family viewing." Extras Review: Another of Criterion's second tier titles, Hopscotch includes only one substantial extra, and informative and entertaining interview/introduction with writer Brian Garfield and director Ronald Neame. This 21-minute featurette discusses the transformation of the source novel into a film and various aspects of production. It's a nice bit of context for a film with so many Cold War plot points. Also included are the teaser and theatrical trailers, the aforementioned optional "family friendly TV viewing" audio track that cuts out all the swear words, and an essay by critic Bruce Eder. Hopscotch is a rather low-key comedic thriller, but it's great fun, and provides Walter Matthau with one of the best roles of his career. I admit, I'm a bit puzzled at it's inclusion in the Criterion Collection, but not a bit disappointed.